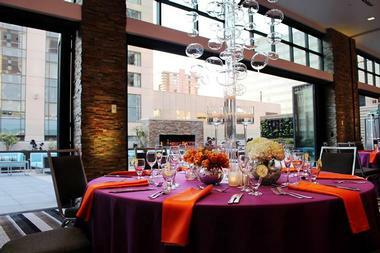 The Curtis in downtown Denver is more than a hotel - it is an experience. 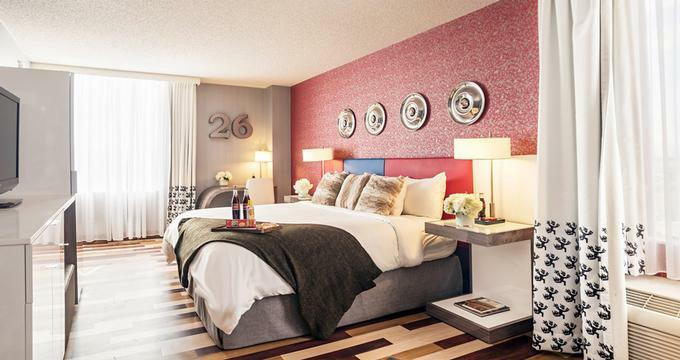 This unique, vibrant pop-culture inspired hotel boasts 336 themed rooms and suites on 13 floors, which feature modern art and ultra-modern amenities. 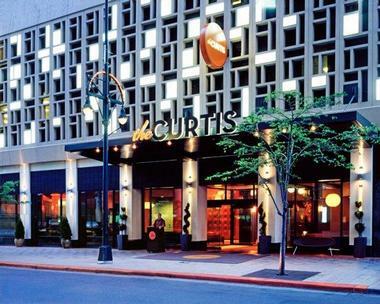 The Curtis is conveniently located directly across the street from the Denver Performing Arts Complex, one block from the Colorado Convention Center and two blocks from the 16th Street Mall, where guests will enjoy excellent shopping and dining. Guests will enjoy the convenience of an on-site bar and restaurant as well as a Five and Dime for fun, retro treats and gadgets. The hotel is pet friendly for a nightly surcharge of $25, and a maximum of two pets per room. Spread over 13 themed floors, the 336 rooms and suites are available in three categories: Standard Rooms, Suites, and Hyper-Themed Rooms. No matter which room guests select, they will be treated to all the modern amenities they could expect from a Hilton chain hotel. The Standard Rooms are available in Queen, King, Corner King or Double Queen. 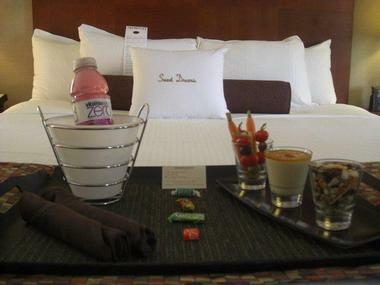 They feature comfortable Sweet Dreams beds and 42" LCD televisions. Each room has a workstation with an ergonomic chair and desk along with Wi-Fi to stay connected with work or friends and family. A large bathroom with vanity and shower are included within each room. 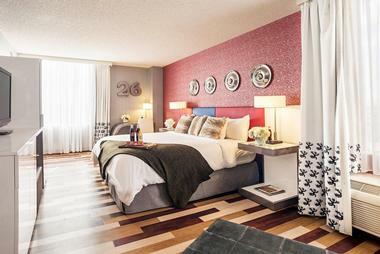 The room décor is still retro-funky with vibrant colors and patterns from the past. There are three Suites available at The Curtis, each boasting 800 square feet of living space. There is a living room area, a kitchenette, and a bar area. Guests can live like a rock star in these fantastic suites. Each of the three suites adorn the name of famous bands: The Kiss Suite, The Rolling Stones Suite and The Spice Girls Suite. There is one Hyper-Themed Room per floor, to match the theme of that particular floor. For example, the Big Hair Floor is found on floor 9 and features the Big Hair Suite, or the Dun, Dun, Dunnnn! Floor on the infamous 13th floor, featuring the Ghostbusters Theme Room. Guests can choose from The Perfect Pair-themed after Lucy and Ricky's living room;The Knock Knock room-a room reflecting loads of knock knock jokes; It's Raining Men-dedicated to the men of One Hit Wonders; The Video Game room-featuring an in-room arcade game and all the décor to match; The Star Trek room-every Trekkie's dream; The Big Hair room-where Marge Simpson and Barbie merge to celebrate the influence of hair on culture; Champion's Lounge-inspired by the "man cave" and adorning Badminton wallpaper; The Chick Flick room-with feathery pillows and a wall mural displaying the differences between a male and female brain; the Disco room-complete with platform shoe wallpaper and lava lamps; Ghostbusters room-on the "scary" 13th floor, the slime green flooring and movie themed decorations add to the ambience; The Talk Show Host-celebrates talk show hosts over the decades; The Jimmy Buffet room-beach décor and 25 hidden Jimmy Buffet tunes within the displayed artwork will excite the biggest fan; and the Talladega Nights room-adorned in the good ol' red, white and blue with a splash of Nascar décor. There is a room or suite to meet each guest's preference, taste and budget at The Curtis-a Doubletree by Hilton. The Corner Office Restaurant + Martini Bar is the on-site restaurant at The Curtis, offering breakfast, lunch and dinner daily. They also have an extensive Saturday Brunch menu and their signature, Disco Brunch on Sundays from 7 a.m. to 3 p.m. Breakfast consists of classic items like eggs and bacon as well as signature options like the Santa Fe Breakfast Burrito. The lunch menu offers burgers, salads, soups and even street style tacos in different varieties. There are choices for each individual preference, including vegetarian options. Dinner is served daily from 3 p.m. to 11 p.m. and boasts an eclectic selection of "Bits & Bites" to large plate choices. Guests can indulge in their poutine, made with duck gravy and cheese curds or the salt and pepper calamari to start off their meal. For an entrée, guests will delight in the unique dishes available including Moroccan Crusted Lamb Rack, Kung Pao Beef and Salmon "Argo Dolce". If there is enough room after dinner, the dessert menu at The Corner Office will not disappoint. Guests will love the option of choosing cotton candy from the menu, or a rich cheesecake and for a Mexican flare, churros are always a hit. Sundays mean a Disco Brunch for all who attend the Corner Office. Guests will enjoy the option of "Bell Bottomless Libations" which means the Mary's and mimosas are free flowing. How could one resist the chef's red velvet waffles or the Bee-Gee Quiche? Most menu selections feature some sort of disco theme. If guests prefer to dine in their room, The Corner Office Restaurant provides room service from 6 a.m. to 11 p.m. daily. A closeby favorite, should guests wish to venture off-site for dinner, is The Oceanaire Seafood Room. They fly in fresh seafood and prepare it exactly to guest's specifications. They feature a raw oyster bar as well as fancy, refreshing cocktails. The Corner Office + Martini Bar is the on-site bar and lounge for guests to mingle and enjoy a martini, ale or cocktail of their choice. This Denver hot spot, is located within the hotel and right across the street from the Denver Center of Performing Arts, drawing in crowds from that venue as well. The wine menu features wines from around the world which will offer something to suit everyone's tastes and preferences. The signature martini menu offers different styles and flavors of martinis whether shaken or stirred. The beer offerings span from local selections which change with the season to imported beer such as Heineken. Happy Hour is the time to be at The Corner Office + Martini Bar. It runs seven days a week from 3 p.m. to 6 p.m. and 10 p.m. to midnight and there are special prices for drinks, as well as a food menu for those wishing to have a bite. Children traveling with their families will fall in love with many of the themed rooms. Especially of great interest to kids would be the Video Game Room, The Spice Girls Room, and even the Ghostbusters Room. 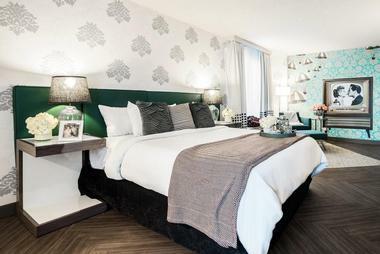 It may be a challenge for large families, however, since the rooms can accommodate up to four guests. There are regular rooms which offer a two bed option instead of the sofabed found in the theme rooms and suites. If the children enjoy sports, families can venture to one of the many closeby sports venues and catch a game or match. These include the Colorado Rockies, the Denver Broncos, the Colorado Avalanche, the Denver Nuggets, the Denver Outlaw and the Colorado Mammoth. For summer time amusement, families can head to Elitch Gardens Theme & Water Park. There are rides for all ages and thrill seeking level. The waterpark is a fun, exciting place to cool off with waterslides and other water rides. The Denver Zoo is only a 15 minute drive away and offers many animal attractions and learning opportunities for old and young alike. This is a year round activity which can be enjoyed during a stay at The Curtis. Only a very short five minute drive from the front door, families can enjoy the Aquarium or even The Children's Museum of Denver, with loads of hands-on activities for kids to explore and learn. A short 20 minute drive away, guests will find Wellshire Golf Course in Denver, Colorado. It is a public course offering 18 holes for all skill levels with four different sets of tees. It is a municipal course featuring over 6400 yards. It opened in 1926 and the greens and fairways are made of blue grass. The Curtis-a Doubletree by Hilton is the perfect place to host an event, organize a meeting or conference or hold a wedding. There is over 28,000 square feet of flexible event space available for various needs and uses. Options include meeting space with high-tech capabilities to ensure everything runs smoothly and attendees stay connected, to outdoor venue space for those wishing to hold an event al fresco. Weddings at The Curtis are far from boring or plain. Guests will enjoy the whimsical touches, the creative culinary delights and the gorgeous views. Couples can opt for an outdoor exchange of vows on the outdoor terrace, which features a stunning backdrop of the Rocky Mountains. The indoor spaces available for receptions include banquet space for 100 to 300 guests, depending upon the style of reception each couple chooses. The staff at The Curtis will work very hard to ensure each couples big day is exactly what they want, without any kinks or snags. The menu will have guests raving for a long time, with the delicious selections available. Meetings and conferences are always welcome at The Curtis-a Doubletree by Hilton. They are infused with fun to balance out what might be a long, dry kind of day. For example, instead of traditional floral centerpieces on each table, attendees may find a centerpiece made from the game Battleship. During breaks, they may enjoy playing a larger than life version of Jenga or indulge in a group session of Guitar Hero. With the high-tech capabilities of each of the meeting rooms, and the balance of relaxed fun, every meeting or conference will be a hit at The Curtis. The Curtis-a Doubletree by Hilton has put in place a program in order to conserve water where guests are asked to hang their towels and use them for more than one day instead of leaving towels daily for maid service to take away and wash. This type of program is common at many hotel chains today. Pets are always welcome at The Curtis for an additional daily charge to cover extra cleaning of the rooms. Advanced booking is recommended for furry friends traveling with guests. 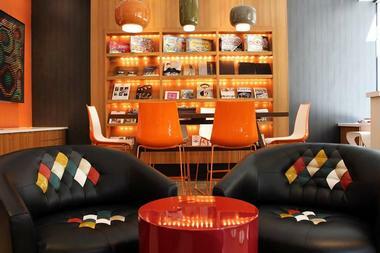 The Curtis is happy to offer guests an on-site Five & Dime store, offering retro toys, gadgets and treats. This follows well with the pop-culture style of the entire hotel. Guests will enjoy boardgames in the lobby or a good old-fashioned game of Rock, Paper, Scissors with the front desk staff to attempt to win a complementary upgrade. The main theme at The Curtis is fun.